Every week we pull together some great Canadian recipes from Canadian food bloggers around the web featuring one main ingredient or dish. Today we're getting creative with 36 rhubarb recipes that are NOT crumbles or crisps! For more rhubarb ideas check out our Strawberry and Rhubarb recipes or 8 Refreshing Rhubarb Beverages. Getting Creative with Rhubarb - Beyond The Crumble! 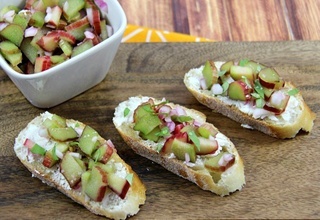 A perfect spring appetizer that's super quick and simple - **[Rhubarb Bruschetta with Goat Cheese](http://familyfoodandtravel.com/2016/05/rhubarb-bruschetta.html)**. From **Family Food and Travel**. Spreadable edible **[Rhubarb Orange Butter](https://urbancottagelife.com/2015/05/28/celebrate-spring-✼-rhubarb-orange-butter/)** - perfect for morning toast or a warm scone! From **Urban Cottage Life**. This **[Rhubarb Pumpkin Seed Cake](http://www.kitchenhealssoul.com/2016/06/08/rhubarb-pumpkin-seed-cake/html)** is such a pretty cake for hosting brunch or a coffee get together! From **Kitchen Heals Soul**. Rhubarb makes an excellent finishing touch to a savoury dish like these **[Pork Chops with Rhubarb Black Pepper Compote](http://www.youcaneatnow.com/pork-chops-rhubarb-black-pepper-compote/)**. From **You Can Eat Now**. This recipe for **[Rhubarb and Caramelized Onion Focaccia](http://www.gettystewart.com/rhubarb-caramelized-onion-focaccia/)** grabbed our attention as soon as we saw it and had our mouths watering immediately. From **Getty Stewart**. Add the nutty taste of walnuts to this **[Rhubarb Walnut Marmalade](http://cultureatz.com/my-8th-blogiversary-rhubarb-walnut-marmalade/?doing_wp_cron=1492800041.7398509979248046875000)** and you'll have your own family classic on hand. From **CulturEatz**. Rhubarb is a refreshingly different addition to a cocktail. Try this **[Rhubarb Pisco Sour](http://www.mykitchenlove.com/rhubarb-pisco-sour/)**. From **My Kitchen Love**. Rhubarb and chocolate aren't a combo you see often and we can't figure out why because its dee-licious! Try it in brownie form with **[Chocolate Rhubarb Brownies](http://www.theendlessmeal.com/dark-chocolate-rhubarb-brownies/)**. From **The Endless Meal**. It's easier than it looks and it's a knockout when it's finished - **[Strawberry Rhubarb Jalousie](http://www.thelemonapron.com/strawberry-rhubarb-jalousie/)**. It'll impress your friends! From **The Lemon Apron**. A big thank you to all our FBC Members who participated in our creative rhubarb recipe roundup!